Most every year, Ken Lunde journeys to South Dakota to visit with his father, and do a little varmint hunting. This year he brought a 4000-fps "secret weapon" with him—a new Cooper Model 21 Montana Varminter chambered in .204 Ruger. During his varminting holiday in South Dakota, Ken had a chance to try the fast-stepping .204 against his "old reliable" .223. He came to favor the .204 for its accuracy, flat trajectory, and superior performance in the wind. 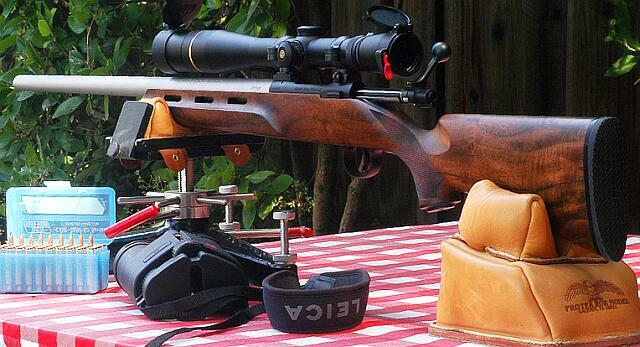 Ken told us: "I love my .223, but the .204 has the edge for Dog-Town duty." I've been a big fan of Cooper Arms rifles ever since my dad introduced them to me a few years ago. He got me started, and now I've joined the club, acquiring seven of my own Coopers. For this particular rifle, I first caught wind of the .204 Ruger cartridge in late 2003, and immediately ordered a Cooper Arms rifle from Mark Blote at First Stop Guns in Rapid City, South Dakota in early December, 2003. In fact, my dad also ordered one at the same time, and we received consecutive serial-numbered rifles in late June, 2004. My dad's rifle ended up being a gift to him from me, as I paid the deposit for both rifles, and also the balance due. I prefer Cooper Arms rifles over others because they perform as they should out-of-the-box, and have outstanding workmanship and beauty. You get form and function. You don't need to choose one over the other. For the price one pays, Cooper Arms rifles are a great bargain. I mount a quality scope, usually a higher-end Leupold with a 40mm objective, go through barrel break-in, and they always perform extraordinarily well. I should state that all of my rifle shooting is geared towards hunting. In other words, any shooting I do on paper is treated as preparation for using the same rifle for hunting, whether it's for varmints such as prairie dogs, or for larger game. For this reason, I feel no strong desire to use match-grade bullets, because they wouldn't be useful for hunting. 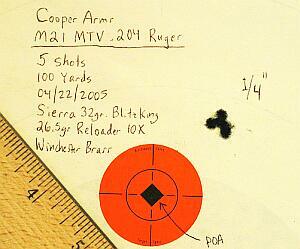 The featured rifle is a Cooper Arms M21 Montana Varminter (aka "MTV") chambered in .204 Ruger. It has a 24" varmint-taper stainless steel barrel with a 1 in 12-inch twist. This twist rate seems to be typical of .204 Ruger barrels from other manufacturers. The stock is AA+ grade Claro Walnut, and has the varmint fore-end, "Buick" vents, and steel grip cap that are standard on the Montana Varminter configuration. Among Cooper's three wood-stocked varmint rifle configurations—Varminter, Montana Varminter, and Varmint Extreme—I prefer the Montana Varminter as it seems to be the best balance of value versus features. Plus, I like the "Buick" vents. They're very pleasing, at least to my eyes. Maybe that's why I own seven of them, in M21 and M22 actions, and in a variety of calibers. Cooper Arms does have a fourth varmint configuration called the Phoenix, introduced this year, which is done in the Montana Varminter style, meaning a varmint forend and "Buick" vents, but instead of Claro Walnut, it is synthetic, in a black or charcoal gray base, with a somewhat red cobweb pattern. It's not overly red, so it blends nicely, and is quite attractive. In fact, I recently had my M22 MTV in .308 changed to the Phoenix configuration, because, as my antelope rifle, it experiences the roughest treatment in the field. For this rifle, I decided to mount a Leupold VX-III 6.5-20x40 LR scope with the Varmint Hunter reticle. The rifle came with Leupold STD bases in Matte finish, and I used Leupold 30mm STD rings in Medium height and Matte finish. I took the time to align the bottom rings on the bases, and properly lapped them. It is a process that takes me about 30 minutes. Sinclair's lapping kit helps tremendously. Interestingly, because this scope has a rather low profile, I could have used Low rings, and there would have been enough clearance for the objective and eye-piece. Other than mounting the scope, no custom work was done, because none was necessary. 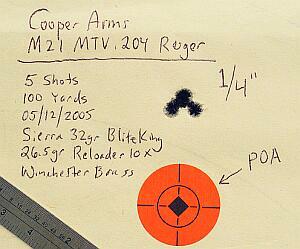 The trigger is superb out-of-the-box, which is typical of Cooper rifles. I first tried factory ammo, loaded with Hornady 32gr and 40gr V-Max. The 32gr load shot the best—five-shot groups were slightly larger than a half-inch at 100 yards. I decided to rack the rifle until reloading components were readily available. What I was mainly waiting for was brass. I was delighted when Winchester released brass for this .204 Ruger cartridge. Then, in early 2005, my dad heard that Alliant Reloader 10X was a good powder for this cartridge, and he worked up a load using the Sierra 32gr BlitzKing bullet. He found that 26.5gr was the right amount for his rifle. Considering that my rifle was probably made on the same day, having a consecutive serial number, I decided to try my dad's load, along with a half-grain up and down, meaning 26, 26.5, and 27 grains of powder. I, too, found that my rifle prefers 26.5gr of RL 10X. With this load, I've been able to shoot consistent quarter-inch five-shot groups at 100 yards. Cartridge OAL is 2.353", or 1.990" measured from the ogive. Thus far, I've loaded 650 rounds of this load, and have shot 550 of them. I am using Winchester brass, Federal 205M primers, Alliant Reloader 10X powder, and Sierra 32gr BlitzKing bullets. I use Forster dies, and load with a Forster Co-Axial single-stage press. Here are two typical targets. 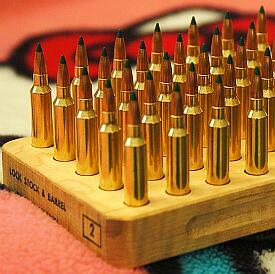 As you can see, this .204 can shoot. I made two trips to South Dakota this summer, and on both trips I brought along two rifles. The first was my "proven" varmint rifle, the one chambered in .223. It has stunning wood, and clearly escaped the factory with AAA grade Claro Walnut. That rifle also shoots consistent five-shot, quarter-inch groups at 100 yards. For the .223, my preferred load uses Winchester brass, Federal 205M primers, Hornady 40gr V-Max bullets (non-moly), and 26.2gr of Vihtavuori N133 powder. I fired 100 rounds through the .223 during the first trip, and it again proved to be an outstanding performer in the field. However, I also was able to "prove" the .204 Ruger rifle during these two trips. In fact, I found that I very much enjoyed shooting the .204 Ruger rifle, which explains why I used only the .204 Ruger during the second trip, although I also brought along the .223. Why did I favor the .204? Well, those little 32gr bullets really zing out of the barrel, with a very flat trajectory, like a .22-250. And, to my surprise, they buck the wind very well, perhaps even better than .223. While I am no ballistics expert, I think that this may be due to its high velocity, clearly over 4,000 fps. .204 Ruger 32gr V-Max .210 Benchmark 28.0 4047 fps 25.50" 17.88"
.204 Ruger 40gr V-Max .275 H4895 27.7 3741 fps 26.93" 14.10"
.223 Rem 40gr Nosler BT .221 Benchmark 27.3 3666 fps 30.67" 19.02"
.223 Rem 50gr Nosler BT .238 BL-C(2) 28.0 3428 fps 34.21" 19.01"
22-250 40gr Nosler BT .221 H4895 37.0 4060 fps 24.73" 16.67"
Load data from Hodgdon.com, for 24" barrel. 2.250" COAL .204s, Fed 205s. 2.210" COAL for .223 Rem, Winch SR. 2.350" COAL for 22-250, Winch LR. Always start 10% low and work up. Calculated at 1000' altitude, 80° temperature. Chart by 6mmBR.com editors. Related to the flat-shooting characteristics of the .204 Ruger cartridge, I found that I was able to depend on my Leupold's Varmint Hunter reticle for both bullet drop and wind compensation. It was a very pleasing experience. For determining ranges in the field, I used a new set of optics for this trip, Leica's new Geovid 8x42 BRF range finder. It combines superb binocular optics with the laser-ranging capability of Leica's RangeMaster 1200 Scan model. It was money well spent. I estimate I bagged about 250 prairie dogs during each trip, meaning about 500 in total for this season. There were misses, of course, but those are generally 400 yards and beyond, when wind becomes too much of a factor, or shooter error. And, for each trip, I managed to get two or three "doubles," which is lingo that means that a single bullet results in two dead prairie dogs. Prairie dogs tend to congregate, and when they do, "doubles" become possible, and "triples" are not out of the question. One of these "doubles" was clearly visible through my scope. The best part of these trips is spending quality time with my dad, doing something that both of enjoy: shooting and hunting. I grew up in Wisconsin, and my parents moved to South Dakota in December of 2004. South Dakota, and sometimes Wyoming, have come to be our preferred hunting states, because they're superb hunting destinations. It is great that my parents have decided to settle in one of those states. In fact, the drive from California is not bad. It takes a little over one day. I also brought my teenage son along. 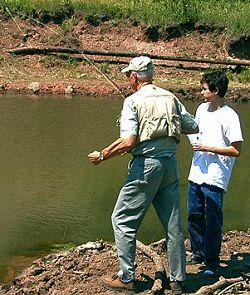 He enjoyed the chance to go fishin' with Grand-Dad, and one day "teen-angler" managed to catch us six fine trout. My first trip to South Dakota, at the end of June, offered a unique oppor-tunity, since First Stop Guns was having a show that coincided with my time in the area. Dan Cooper, founder and owner of Cooper Arms, was present at the show. 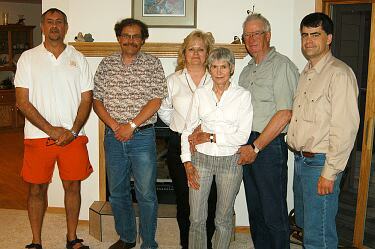 My dad and I decided to host a small dinner at my parents' new home, and we invited Dan Cooper and others. I brought tenderloin steaks from California for this. In addition to Dan Cooper, Mark and Steve Blote of First Stop Guns, along with Paulette Kok of Dakota Arms, attended the dinner. It was a pleasure and honor to be in their company. They're all very personable. My dad has a rather vast collection of Cooper Arms rifles, so I naturally invited Dan Cooper to check them out. A couple of them turned out to be special. 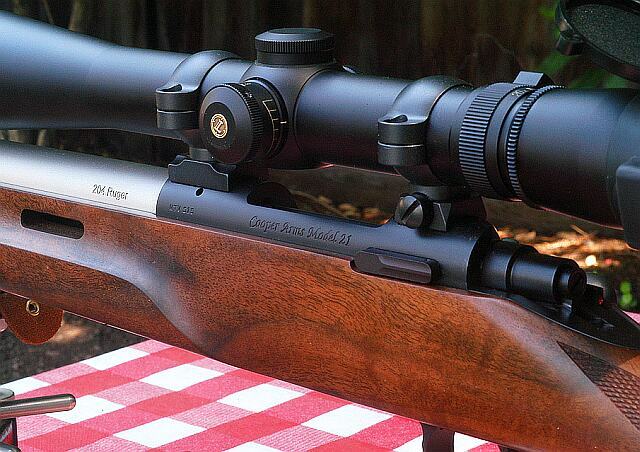 One turned out to be the very first .22-250 rifle that Cooper Arms built. 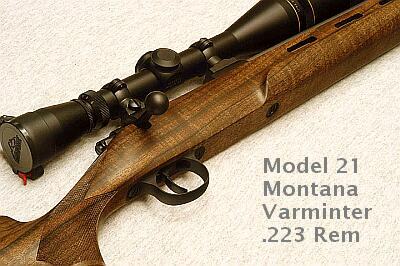 It is a Model 22 Varmint Extreme with ebony fore-end tip. Another is an Model 21 Classic with Schnabel fore-end, and according to Dan, less than 30 such rifles were ever crafted. It's in the rack picture at left. Two of Dad's rimfires are also very early Coopers, with two-digit serial numbers. They were made before Cooper started using the magazine insert supplied by Anschütz. 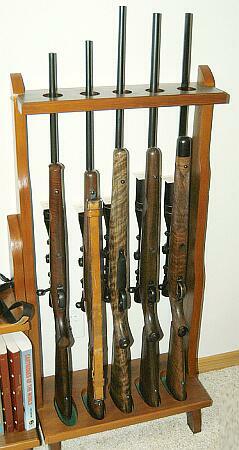 And check out the middle rifle in the rack. It's a Dakota Arms Model 97 Deluxe Hunter that I bought for Dad. He hand-picked the amazing wood blank, and it turned into an outstanding rifle stock. You can see how it stands out in the photo. Interestingly, the day before our dinner, I used Dad's M21 with the Schnabel stock, chambered in .222, to hunt prairie dogs in the 9,000 acres of public hunting land bordering the eastern side of my dad's 56-acre "recreational" property, situated just north of Hot Springs, SD. Here's a photo. Yes, I'd say this is a great place to hunt and "get away from it all". Speaking of Dakota Arms, I ordered one of their new "Serious Predator" rifles last October, and picked out its wood (AAA grade Claro Walnut) last December at the factory. I originally ordered it in Tactical 20, but changed it to .204 Ruger. I should have it in a month or two. I plan to see how it shoots compared to my Cooper. Clearly, it is up for some serious competition from the get-go, because my Cooper is shooting quarter-inch groups using hunting bullets. Photos Copyright © 2005 Ken Lunde, All Rights Reserved, used by permission. All other content and design Copyright © 2005, 6mmBR.com, All Rights Reserved. No reproduction of any content without advanced permission in writing.